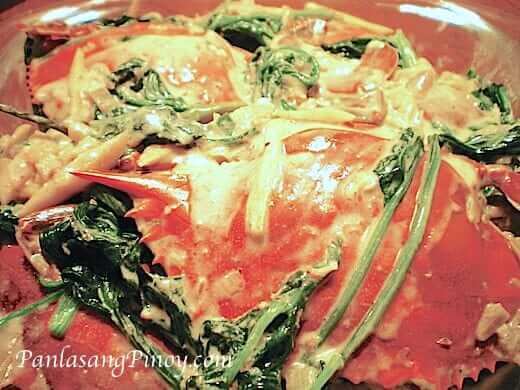 Ginataang Alimasag (or alimango) are Crabs cooked in Coconut Milk. This ginataang alimasag recipe features the use of spinach and Thai chili as a replacement for Malunggay. Squash and string beans (kalabasa and sitaw) can also be placed instead of Spinach . Cooking seafood in coconut milk is common in Philippine Cuisine. Dishes such as ginataang hipon, seafood in coconut milk, and sinanglay na tilapia are just few of them. Dishes like ginataang alimasag exist because the combination of seafood and coconut milk is really awesome. The flavor of the crab (or any seafood in particular) is absorbed by the coconut milk, which makes is perfect when eaten with rice. Preparing ginataang alimasag is easy. For a much better taste, you can cut the crab vertically in half before cooking so that all the flavor will come out. Eating dishes such as this will require you to serve more rice. Be careful though if you are diabetic or watching your sugar level. Try this Ginataang Alimasag Recipe and send us your feedback. This is a recipe for ginataang alimasag. These are blue crabs with spinach cooked in coconut milk. Tiger Prawn is fine as long as you don’t overcook it. Keep on cooking and please spread the word. I like your site, my sister from guam gave this to me. Please post some more recipe. Thank you! this one is sooooo good, I will make this one for potluck , sigurado patok to sa kanila ,kakaiba kasi .Thanks bro!!! Hi.. I really love your videos. It really helps me with my Cooking.My friends were really amazed with the recipe I cook.. Now I don’t really worry for a daily recipe. Your site is just a click. The hard part is looking for the right ingredients. Good thing we have Asian stores here in Canada..
Hi Tobeymarx, good to know that. See you around. I always check you site…my fiance loves ginataan…so I will try cooking these later for dinner… Thanks for all the recipes here…it helps a lot…especially for those Filipino like us overseas.